Needless to say, most of my thoughts these days are on my upcoming trip to New York City. If you are new to this blog, I'll fill you in: I will be in Manhattan over the weekend attending a four-day workshop related to my profession. I plan to arrive in The City on Thursday, check-in to my Midtown hotel, then dress en femme and remain en femme until I check-out on Monday. It is not the first time that I have been en femme for an extended period of time. In the past, I have attended trans conventions, where I was en femme 24/7 for four or five days and last fall, I attended Fantasia Fair, where I was en femme for a week. I enjoyed those experiences en femme, but in reality, trans conventions and Fantasia Fair are extensions of our closets, i.e., they are safe havens for transgenders. Most of the action at trans conventions takes place in hotels where the staff is well aware of their guests' status. Since it is their job to take care of their guests, convention attendees feel very safe and comfortable at such events. The situation is the same at Fantasia Fair only on a larger scale. Like the staff at the convention hotels, the whole of Provincetown, which hosts the Fair, takes care of its visitors, so fairgoers feel very safe and comfortable having the run of the town for a week in late October. My trip to New York City is different. I will be en femme 24/7 without a safety net. Besides attending the workshop, I plan to experience The City en femme. The workshop ends early each afternoon, so the rest of the day, I am free to visit museums, go shopping, see shows, go to the Top of the Rock, dine, dance, go to Mass at Saint Pat's, etc. and that's what I intend to do... all en femme or rather, as myself. * Thank you, Holly, for the word "womanhattan," as well as for the Audrey Hepburn quotation, which helped take the edge off of the trepidation I am having about this upcoming adventure. I have arrived safe and sound. Checked into my hotel room and will get en femme real soon now. This will be short because it is 12:25 AM and I am tired. Erica, from My Husband Betty message board met me at my hotel and we walked down 7th Avenue looking for a place to dine. We ate at an Italian restaurant called Restivo. The food was excellent and we were treated like ladies. After dinner, we took a cab to Nowhere, a GLBT-friendly bar, had a few drinks and met some other girls I know from My Husband Betty message board and elsewhere on the Internet (Caprice, Abby, Devon, Rita, Skyler). I tired and took a cab back to my hotel around midnight. I had a wonderful time, but I am too tired to write much more. The accompanying photo is Erica and I at Nowhere. I attended my workshop in the morning. I did not hear a discouraging word. A number of people, both male and female, took the initiative to engage me in conversation. It was hot and humid, not my kind of weather when wearing a wig and foundation garments, but after the workshop, I went out on the town. I walked four blocks up to Sephora and bought some makeup, then I crossed the street to visit Macy's. The store is huge. It just goes on and on and on. I found a beautiful dress and I tried it on. It fit fine, but it was very low cut and I just don't have the body for it. So, I did not buy it. I was very, very tired and returned to my hotel. I just wanted to rest and I did not look forward to going out to dine. Like magic, someone slipped some menus for takeout under my door, and I took advantage of their offerings and had Japanese take-out delivered to my room. For dessert, I hit the vending machine and had a strawberry Pop-Tart. It was not a glamorous evening in the Big Apple, but being a girl is not glamorous most of the time, and so it goes. This morning, I went to my workshop carrying my purse and a large shopping bag containing the workshop materials. I get on the hotel elevator and a 40-something couple are already aboard. As I got on, I smiled, and turned around to watch the floor numbers flash by. Suddenly, the guy in the couple says, "Wow, she already has done a lot of shopping without leaving the hotel!" At first I did not get what he meant, but then I realized the "she" he was referring to was me and he was making a reference to my full shopping bag. I blushed and the woman said, "Good for you." That was an auspicious start to my day. The workshop went well and I learned a lot. Also, during today's session, I took a big step; we each had to do a brief autobiography and when it was my turn, I came out that I was transgender. I did not hear a discouraging word; on the contrary, most people were very supportive and I was glad I did what I did. The weather continued to be poor with rain off and on all day. During the workshop, I made plans with a woman who was staying in the same hotel as mine to do something together with her and her daughter, who was traveling with her, but not attending the workshop. (I did not want to be solo again.) Since the weather was not conducive for seeing the Big Apple on foot, we decided to take a cab and see the Metropolitan Museum of Art. We arrived at the museum around 3:30 PM and viewed the exhibits for over four hours. 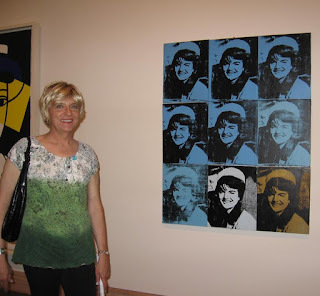 (That's me in the photo next to Andy Warhol's take on Jacqueline Kennedy.) The museum is huge and we probably saw only 1/10th of its vast spectacular collection. It was a great experience. We decided to dine at the museum's restaurant and the food was as good as the art. And I highly recommend the Mango Frida cocktail! The museum closed at 9 PM, but we did not finish dining until 9:15, so we had the place to ourselves as we walked from the restaurant to the exit. We took a cab back down 5th Avenue and were back at our hotel at 9:30 PM. A lot of people saw me en femmetoday, probably thousands of people. And everybody who I personally encountered, treated me like a lady. I did notice more than a few people (mostly guys) giving me a second look, but they probably were just taken aback my Amazonian appearance! My confidence en femme has surprised myself. I hailed cabs en femme (and usually caught the first one to pass by) and I spoke to people throughout the day and did not think twice about it. For example, when we were in the museum, I asked various museum personnel various questions. In the past, I would have asked one of the two women I was sightseeing with to do my bidding. It was a great day and tomorrow promises to be even better! I mentioned that today, I came out as transgender to the other people attending my workshop. I want to flesh out that story a bit. I planned to attend en femme and if anyone asked, I would tell them what was going on, but I had no intention of coming out to the whole workshop. Part of the workshop was show and tell; we had to bring something to the workshop, preferably from our youth, and explain how that object impacted our lives. So, one fall day in 1960, about a month before the November Presidential election of John Kennedy, I find two new issues of Mad for sale; one issue congratulates Nixon as the election winner and the other issue congrats JFK. Only having a quarter, I can only buy one, and being a good Roman Catholic, I buy the JFK issue. After paying for the magazine and getting Mad in my hands, I realize that the Nixon and JFK issues are the same issue; the same magazine had two covers! The front cover had Nixon and the back cover had JFK, however, the back cover was printed upside down so that it opened with the binding on the left as if it was a front cover! Originally, that is how I intended to end my show 'n' tell, but the night before my presentation, it suddenly hit me that that two-in-one Mad issue also defined my life as transgender... half and half... man and woman... ying and yang! It was an epiphany of sorts to me and I had to share it, so that is how I actually ended my show 'n' tell. It was no big deal. I am sure that two days into the workshop, all the attendees had me figured out. I was not fooling anyone, so my revelation would not be a surprise. And it fit so well into my show and tell that I just had to do it. Seeing everyone's reaction to my show 'n' tell, I think just about everyone appreciated my story and its honesty. Like one of the attendees, a male 60-something retired teacher, who went out of his way to tell me the next day that he loved my metaphor! I am sitting in my hotel room early Sunday morning sipping my first cup of coffee with random thoughts flowing through my head. 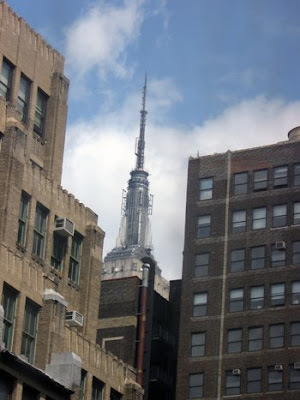 It is so cool to sit here and look out the window and see the top of the Empire State Building looming over the roofs of the buildings across the street. The Building is quite imposing since it is only three blocks away, but the first day I was here, I did not know it was there because the low clouds obscured it. Friday, I saw it for the first time in all its glory. When I awoke this morning the clouds cut off the television and FM radio transmitter antennas at the top of the tower, so all you saw was its Zeppelin mooring mast, as it appeared in King Kong. Like I said, "so cool." I did some outreach last night over dinner. As I wrote last night, I went to the Metropolitan Museum of Art with a woman from my workshop and her traveling companion daughter. While we dined, we talked about our lives and during a lull in the conversation, I asked her if she wanted to know about my transness. She admitted that she was dying to ask, but did not ask because she respected my privacy. I told her I love to talk about it and I proceeded to do so. She got "it" as was evidenced by her questions. She also thought that my coming out in the workshop was a very big deal and she gave me a lot of credit for doing so. Most of the people in the workshop are very cool. After I came out, my workshop mates seemed friendlier to me. One young woman, who was very friendly to me even before I came out, also went to the Metropolitan Museum of Art yesterday and we ran into her a few times. During one run-in, she insisted that I meet her husband, who was looking at some artwork nearby. So, she fetched him and introduced us and we had a short and pleasant conversation. It made me feel so good that she would do that! That she thought well enough of me to want to introduce me to her spouse made me feel that she considered me a normal person and not a freak. 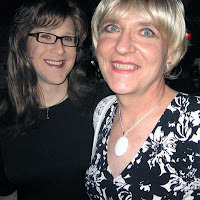 Erica, the transwoman I went out with on Thursday night mentioned our outing on the My Husband Betty message board and I quote, "Staci, who in addition to being muy bonita was terrific fun to hang out with." I thank her for the kind words. The sky is brightening and now I can see all the way to the top of the Empire State Building, so I am looking forward to another wonderful day in womanhattan. 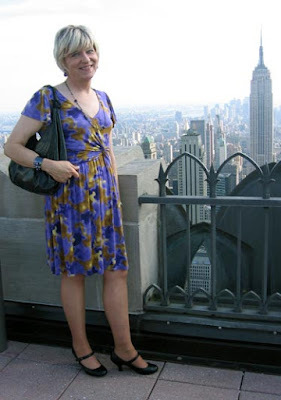 Sunday in New York and I dressed up for the day: my purple dress, jewelry, mid-heel Mary-Jane pumps, suntan pantyhose, etc. My workshop ended about 2 PM and I returned to my hotel room to freshen up. After touching up my makeup, I went outdoors (the weather was perfect) and hailed a cab. A cab stopped, I got in and told the driver to take me to Rockefeller Center. The driver told me he could not take me there because the Puerto Rican Pride Parade on 5th Avenue blocked the path to the Rock. So, I got out of the cab and decided what to do. I had fallen in love with a perfume sample of Aquolina Pink Sugar that I received at Sephora, so I decided to walk the six blocks to their West 34th Street store to buy the perfume. It was my first time out wearing the mid-heel Mary Janes I bought a few weeks ago. When I paid for the shoes, the cashier commented that the shoe was popular with dancers because they are very comfortable and I was discovering the same thing as I walked from my hotel to Sephora. In Sephora, I walked around the store looking for the perfume. During my hunt, I passed an older gentleman and as I walked by him, he turned to me and said, "I want to give you a kiss" and then he blew me a kiss! Flabbergasted, all I could do was whisper, "Thank-you." I found the perfume, paid for it, and exited with my heels never touching the ground! Since my new shoes were cooperating, I decided to walk a half-block to Herald Square and take a few photos. After taking a few shots, I saw an empty chair and sat down to take a break. While I sat, I took a few photos of myself. They turned out OK, but I could only stretch my arm so far and I wanted something better. Seated next to me was a older gentleman with a camera case in his lap. I tapped him on the shoulder and with a big smile, I asked him to take my photo. He smiled, I handed him my camera, and he took a photo of me. After resting for five minutes, I decided to walk eight blocks up Broadway to Times Square. I took photos along the way and with no complaints coming from my feet, I decided to head east towards Rockefeller Center. While waiting for the traffic light to give me the go-ahead to cross Broadway at West 45th Street, I took some more photos of Times Square. A trio of women joined me at the crosswalk and one asked me if I'd like her to take my photo. Of course, I accepted her invitation and the Times Square photo (right) is the result of her handiwork. Five more blocks and I was in the middle of Rockefeller Center. Foot traffic was light, so I thought it might be a good time to go to the Top of the Rock. I entered the RCA Building (you call it what you want, it will always be the "RCA Building" to me) and found the ticket counter for the Top of the Rock. My timing was good; there were no lines and I was on my way. Before getting on the elevator to go to the top, I had to go through a the metal detector and I set it off. The guard looked at me, then waved me on with the words, "Must be your bracelets, hon'." That was a new one! I've been called "miss" and "ma'am" before, but never "hon'." I smiled at the guard and got on the elevator. Seventy stories later, I was on top of the RCA Building and the weather was perfect. Visibility was virtually infinite and the view was spectacular. To the south, the Jersey shore was visible, to the north, Catskill peaks poked over the horizon, to the northeast, I could see the Connecticut shoreline, and all around me was The City. I spent about an hour atop, taking a lot of photos and taking it all in. I asked a couple of people to take photos of me and more than a couple of people asked me to do the same for them. Next, I wanted to go to Saint Patrick's Cathedral, which is just across the street from Rockefeller Center. I took the elevator back down and walked to 5th Avenue. During this short walk, a young man cut me off and immediately apologized, "Excuse me, hon'." Second "hon'" in an hour. I started to wonder if "hon'" was a New York thing, but I didn't care. A blown kiss and two hon's meant I was passing, however, I was about to receive another term of endearment that would seal it. As I walked up 5th Avenue toward Saint Pat's, a small group of high school boys were heading towards me. As I passed through the group, I heard one of the boys say, "Dyke." Now I knew I was passing! I crossed 5th Avenue and entered Saint Pat's. There was a Mass in progress and the priest was just finishing the sermon. This was a big deal for me. I was a Roman Catholic and my religion was the source of much needless guilt about crossdressing throughout my life. I overcame the guilt years ago and now I was entering the church for the first time en femme. When I planned this visit, I thought it would be like spitting in the eye of the Church of Rome. "Take that for all the pain and suffering you brought down upon me for so long." But instead of feeling vengeful, I felt wonderful. The prodigal son has returned, but now he is your daughter! It was now 7 PM and the last meal I had was breakfast, so I was hungry and decided to treat myself by having dinner at the Rink Bar, the outdoor bar/restaurant that resides in the Rockefeller Center ice skating rink when it is too warm for ice skating. My table for one was immediately in front of the fountain, so I did not feel lonely eating solo because Prometheus was right by my side. I had peach sangria, watercress salad, rissota crab cakes, and coffee. They were all excellent and they were all only $50 and change! After dinner, I hailed a cab and enjoyed the ride down 5th Avenue while reflecting on my wonderful day out en femme. Monday was a half day en femme. I attended the last day of the workshop en femme, then returned to my hotel to change into boy mode for my trip back home. As a result, I did not have much interaction with the public at large en femme. 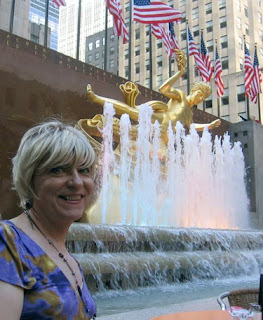 The photo shows me dining with Prometheus at the Rink Bar restaurant in the heart of Rockefeller Center. In conclusion, I found myself. * Phoning the workshop to find out if they had any issues about my attendance en femme. * Getting their green light of support to attend in whatever way I felt most comfortable. * Finding a group of fellow attendees, who did not shun me, but respected me. * The group's respect motivated me to be completely up front with them about my transness. * My planned "show 'n' tell" became a natural conduit for coming out. * The group's respect seemed to grow ten-fold after I came out. * Which permitted me to get a lot out of the workshop that I will apply in my career as a writer. There was always the possibility that something could go wrong, but it did not. Maybe I was just lucky, maybe I was well-prepared, maybe some higher power was watching over me, I dunno. But I do know that integrating all of me at the workshop permitted me to integrate myself outside the workshop, too. I was myself throughout the day rather than trying to impersonate someone else. And integrated as myself, I felt very confident about myself. An example: one morning after I dressed en femme, I adjusted the thermostat in my hotel room and somehow managed to shutdown the system. Nothing I tried could bring the system back to life, so I called the front desk and they said they would send someone up. In the recent past, I would have panicked and changed into boy mode as quickly as possible. But, that morning, I stayed in girl mode. When the maintenance man showed up, I interacted with him without concern or nervousness and he reacted in a positive manner. Another example: Flag down a cab wearing a dress and high heels and you usually get the first available cab. Now that's power and it just added to my confidence! I am so happy that I did what I did. It changed me for the better by making myself whole and more confident, so confident that I no longer fear being outed, nor do I fear coming out to anyone.